Ligamentotaxis cannot reduce a depressed "die punch" fracture, restore volar tilt, control radial translation or stabilize an unstable distal radioulnar joint. Supine position with radiolucent hand table. All bony prominences well padded. 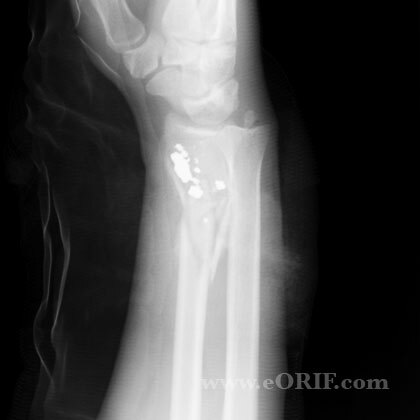 Two 1-cm incisions over the dorsal radial aspect of the 2nd metacarpal base and radial shaft. Blunt dissection to metacarpal. Place 3-mm self-tapping half-pins at a 30°-45° angle dorsal to the frontal plane of the hand. 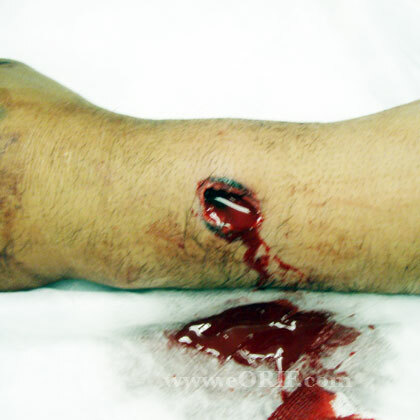 4-cm skin incision10 cm proximal to the wrist joint. Dissection down to the radius between the extensor carpi radialis longus and brevis tendons. Between ECRB and EDC is an alternative. 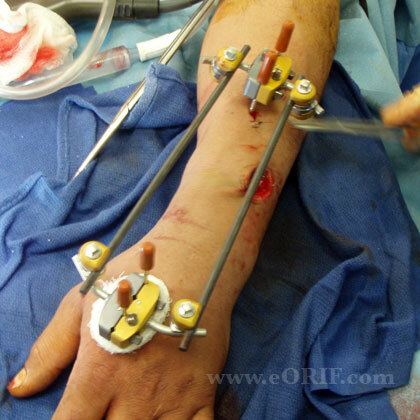 Dissection between the BR and ECRL risks the superficial radial nerve. Insert towh 3-mm half-pins (1.5 cm apart) at a 30° angle dorsal to the frontal plane of the forearm. Apply clamps and bars per manufacture specifications to construct frame. Consider augmentation with bone graft, internal fixation, K-wires as indicated. Apply traction with the Ex fix. Consider one 1.6mm/0/062 k-wire through the radial styloid, one or tow from dorsal to palmar to stabilize palmar tilt and one or two transverse subchondral wires for articular support in intra-articular fractures. Then release traction so that ex fix is in neutralization and not distraction. Ensure wrist is not distracted. Distraction increases carpal pressures and can lead to CRPS and increased wrist stiffness. 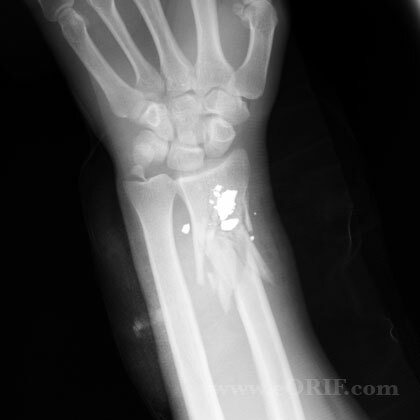 External fixation of the wrist should be used as a neutralization device, not a traction device. Post-op: Volar plaster splint. Elevation, NWB. Active and passive finger ROM. 7-10 Days: Discontinue splint. Clean cutaneous/pin interface with peroxide BID. Active and passive finger ROM. 6 Weeks: Remove Ex fix. 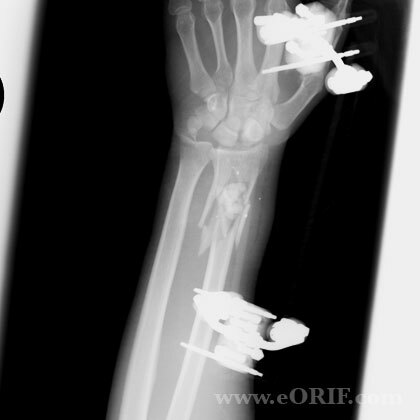 Consider short arm cast / removeable splint. Active and passive finger ROM. 3 Months: Consider occupational therapy if wrist stiffness prevails. Sport specific rehab. 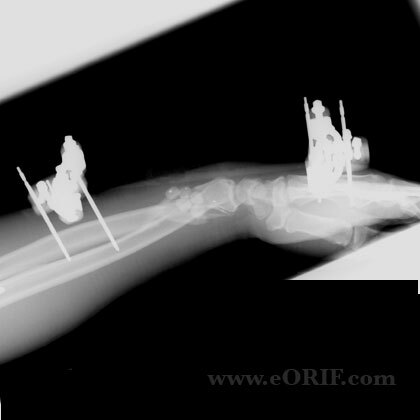 59° passive extension and 57° passive flexion, 5° volar tilt and 25° radial inclination, with 2.2-mm ulnar-positive variance. (Wright TW, J Hand Surg 2005;30:289).